You’ve put the tree up, you’ve done the shopping, you’ve started writing the cards. All you really want is a rest, isn’t it? 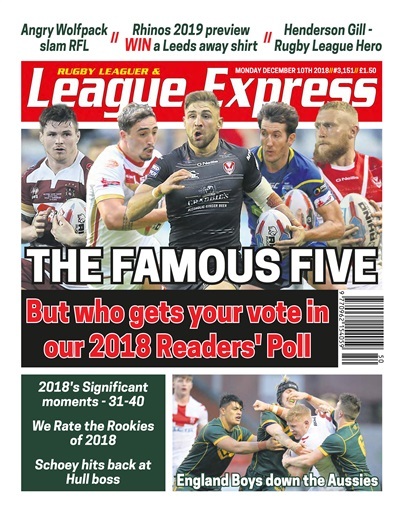 Well sit back and relax, because League Express is back as always and its another busy edition. Here’s what’s inside. Toronto hit out after being asked to pay a HUGE bond to play in the Challenge Cup. We have reaction and the figures involved. Kallum Watkins opens up about his battle with depression. 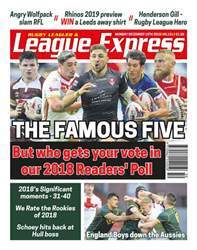 Sticking on Leeds, we preview 2019 with new head coach David Furner, we speak to marquee signing Trent Merrin and we give you a chance to win a replica Rhinos away shirt. The latest on the proposed Joe Wardle/Sebastine Ikahihifo swap deal. Schoey’s war of words with Hull FC owner Adam Pearson continues! The Readers’ Poll is back! Don’t forget to get involved and cast your votes. Warrington ace Ben Currie provides us with an injury update. Justin Holbrook talks fullback selection dilemmas. The Yorkshire Cup is back, but two clubs aren’t pleased. The latest on Keighley’s precarious decision, but it seems there is light at the end of the tunnel. And we look back at the rookies we picked at the start of the year and assess how they got on in 2018.